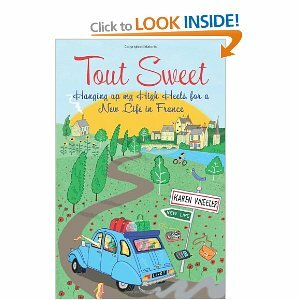 After reading the Olive farm books by Carol Drinkwater i was hooked on tales of French life and found a book in a charity shop by Karen Wheeler called Tout Sweet. In her mid-thirties Karen has it all: a career as a fashion editor, a handsome boyfriend, a fab flat in west London and an array of gorgeous shoes. But when her ‘plus one’ leaves, she wonders if there is more to life than high fashion. So, she hangs up her Manolos and waves goodbye to her city lifestyle, deciding to go it alone in a run-down house in rural Poitou-Charentes, western France. Once there, she encounters a host of new friends and unsuitable suitors, soon learning that true happiness can be found in the simplest of things – a bike ride through the countryside on a summer evening, or six glasses of Pinot in a neighbour’s garden. If you’ve ever dreamed of chucking away your BlackBerry and downshifting, Tout Sweet is perfect summer reading. She has written three books, the fourth is on its way soon I hope. I highly recommend her books they will capture you heart.